Il Best Western Plus Executive Inn & Suites è situato nel centro di Manteca. L'hotel è vicino alle principali attrazioni turistiche. Approfittate tutto l'anno del miglior prezzo garantito e di offerte esclusive. Una gioia per gli appassionati delle attività all'aperto, questa perla di Manteca ti permetterà di scoprire in tutta facilità le ricchezze della California del nord: dalle maestose montagne dello Yosemite alle colline ondulate della regione dei vini. 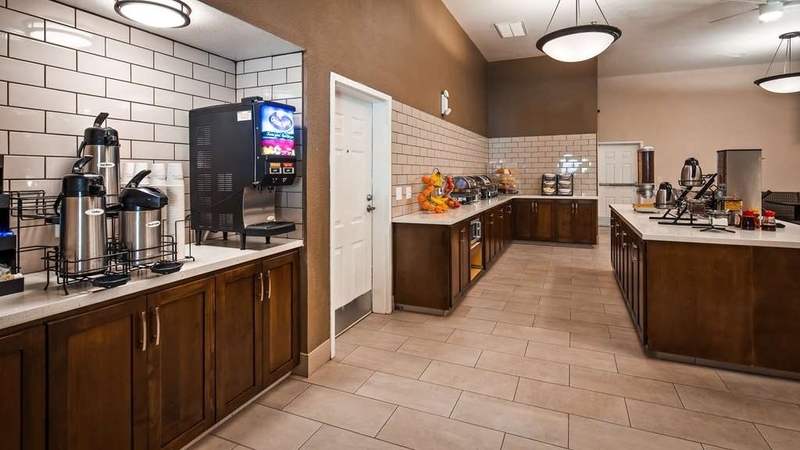 Situato all'incrocio delle autostrade 99 e 120, il Best Western Plus Executive Inn & Suites è situato nel cuore della Central Valley californiana, il che assicura ai nostri ospiti un facile viaggio verso qualsiasi destinazione. Infatti, quest'hotel di Manteca è annidato tra il parco nazionale Yosemite, Sacramento, San Francisco e Fresno. Trascorri la giornata alla scoperta dello Yosemite, guarda una partita di calcio o baseball al Big League Dream oppure approfittane per seguire un torneo al Mistlin Sports Complex. Per attrezzarti per ogni tipo d'attività, fai una sosta al Bass Pro Shop® (dalla superficie di oltre 11. 000 metri quadrati), situato a meno di cinque chilometri di distanza. Le attività stagionali, come le fiere di strada e il labirinto delle zucca della famiglia Dell'Osso attraggono visitatori ogni anno, così come le degustazioni dei vini nelle vicine vigne della famiglia Delicato. Gli ospiti di quest'hotel di Manteca possono anche raggiungere a piedi alcuni dei migliori negozi e ristoranti dell'area. Molti dei nostri ospiti vengono a trovarci per un soggiorno di piacere, ma ci troviamo in posizione conveniente anche rispetto a diverse aziende, come Ford® Motor Company, Sharpe Army Depot, Delta College, University of Pacific e alcuni negozi di rilievo. Se cerchi un hotel a Manteca dotato di tutti i comfort di casa, il Best Western Plus Executive Inn & Suites è ciò che fa per te. Questo hotel, in cui sono ammessi gli animali domestici, dispone di camere lussuose, colazione all'americana gratuita e una splendida piscina con idromassaggio. Vieni a trovarci e scoprirai perché crediamo di essere tra gli hotel più belli di Manteca. Prenota oggi stesso!Ti auguriamo un soggiorno gradevole! "Clean and quiet hotel in a dirty and noisy town"
Overall this hotel was clean and quiet. We had a stressful day, can to the hotel and could relax in a big room and watch a movie. Slept well through the night, no disturbing noise and had a peaceful breakfast in the morning. We travel with a service dog and all went well with her also. "Fine for 1 night stay"
I needed a room for a night while visiting family in town. This place is very clean and the rooms were nicely appointed. The downside is the doors face the outside which is not one of my favorite things. The hotel is also on a busy road which brings in a lot of noise. The wifi and breakfast is free. Front desk service was good as well. "Stay only if you dont have any other options"
Dogs barking; Was not upgraded to suite, but charged for one; Heating unit filthy and needed filter change; Fridge was noisy and kept cycling on and off - which made for a very noisy long night.If you just need a place to lay your tired head and this is it.... It will do. Thank you for your feedback. I apologize that we failed to meet your expectations. I will share your review with our team so we can focus on improving for our future guests. I hope you will consider giving us another opportunity to serve you in the future. I stayed in the suite which was very comfortable. I liked the set up and it was very roomy and was clean. The only thing was the bed was a little hard. Wish it was a little more plush, but that's my preference. Thank you for your review of the Best Western Plus Executive Inn & Suites. I was pleased to read that you had a comfortable stay in one of our suites. I hope you will choose us again next time you are in the area. Worst hotel experience! Dirty, dirty, dirty. Non smoking hotel had smokers, cigarette butts and empty beer cans everywhere. Guests on 3rd floor partying all night, yelling profanities to people on ground floor and hotel desk said there was nothing they could do about it. Shower head falling off wall. Debris under beds, no cleaning in years! Breakfast ran out and not replenished. Train noise all night. Mattress worn out. Pillow smelled like vomit. Didn't sleep a wink. Never received email bill for express check out. Thank you for your feedback. I am very sorry that we failed to meet your expectations. I will share this review with our housekeeping and maintenance teams so we can focus on improving for our future guests. Also, I will make sure you get your receipt emailed to you. I hope you will consider giving us another opportunity to serve you in the future. This hotel is one of the best I've stayed. Newly renovated with large room and bathroom. Property is well maintained with lots of parking room for people with boats, etc. Hot breakfast every morning, coffee in your room, fridge, microwave and large flat screen TV. Also WiFi. Service was excellent anything you wanted to make you comfortable. Friendly atmosphere and quiet. Pool and Jacuzzi was a nice addition and extremely clean. Would definitely stay here again And would recommend to anyone who is passing through this area!!! Thank you for your review of the Best Western Plus Executive Inn & Suites. I was pleased to read that our hotel is one of the best you have stayed in. I am glad that our hotel met all of your needs and you enjoyed the breakfast. Thank you for recommending us and I look forward to your next stay! This old motel-like establishment was NOT up to the usual BW Plus grade!! 1. Guest room doors are exposed to the outside which lessens privacy and security for guests. 2. Some of the fitness equipment was not operational to the dismay of us and other guests. 3. The water level was about 6 inches deep in the tub by the end of my husband's shower! Yuk! Needless to say, I passed on taking a shower after his experience ☹ 4. No decaf coffee at the ready at breakfast and food offerings were meager for a BW Plus. Thank you for your feedback. I am very sorry that your stay was not enjoyable. We have put in a service request for the equipment that is out of service in the fitness room. I will share your review with our maintenance team as well as our breakfast team so we can focus on improving for our future guests. Also, we do offer upgraded rooms that are in an interior corridor for more privacy. I hope you will consider giving us another opportunity to serve you in the future. We stayed here one night when we were traveling around the western states of the US. Rooms were giant could've slept a whole family instead of just us two. Great comfort and the bathroom was grand as well. Close to some shops like target, tj maxx and others. But also different kinds of restaurants very close to the hotel. Breakfast was simple but good for one or two days. Would not mind staying here a second time when needed! Thank you for your review of the Best Western Plus Executive Inn & Suites. I was pleased to read that our hotel met all of your comfort and convenience needs during your road trip. We hope you will choose us again next time you a traveling through the area. "Best on the outside, but room was not so much in best working order." Plus it was unclear how expeess checkout actually works. Now I wonder if I was supposed to do anything other tgan leave keys in room. Seemed like everything was broken or slightly off/unplugged. We arrived late so didn't have chance to correct any issues. Staff was friendly and helpful. Thank you for your feedback. I was pleased to read that our staff provided you with good service. However, I am very sorry that the room was not up to the standards you would expect. I will share this review with our maintenance team so we can focus on improving for future guests. I hope you will consider giving us another opportunity to serve you in the future. We stay here twice a year for a project we work on in Stockton. The area is a tad noisy (near the freeway) but overall we are not bothered. Can be busy when there are sports tournaments in the area but staff are friendly and helpful. We get early check-in when it is available. One of the best breakfast deals for the money with a good selection for all age groups. Thank you for your review of the Best Western Plus Executive Inn & Suites. I was pleased to read our hotel continues to meet your needs while in the area for your project. Also, I am glad that you enjoy the breakfast. We look forward to your next stay. I was on business trip and stayed at the hotel lots of food places close by I walked a couple of times. Kind of hard to get in but lots of parking and quiet place . Great breakfast lots of choices and room to sit and watch TV. Room was great and I will stay again. The stay was pleasant, beds comfortable, room clean. Lots of work trucks from businesses lodging their employees working in the area. Entrance to parking lot alittle difficult since freeway is close by but chek in staff was kind enough to give us a room away from the freeway noise. One day/night not enough to express adequate opinion but our stay was good. Would not stay at this hotel or refer friends or family to stay here. Room was noisy, was only able to get about 2 hours of sleep, room smelled, cockroaches, air condition wasn't working properly, no water pressure, and bed uncomfortable. Will stay at Holiday Inn Express or Hampton Inn next time. Thank you for your feedback. I apologize for the problems you experienced during your stay. We do have regular pest control who services our rooms and exterior of the property monthly. I will share this review with our maintenance and housekeeping teams so we can focus on improving for our future guests. I hope you will reconsider giving us another opportunity to serve you in the future. We were in a bug grupp, tjat hand to the Hotel in the afternoon. Got a room close to the highway - with a lot of noice. Hur ur sås not the worst. The bathtub and the zink was stoppet (dont know ro right word). I told the young and very nice girl at the front desk the problem and she should do her best. The problem was that there wasn't ant plumber until next day... AND the hotel was fully booked. Well we got an other room. Good. We heard that out breakfast should be something extra. I can tell you that it was one the the simpliest breakfast ever. I do not Kina why the hotel tell us, that ut should be a luxury one. No, I will never recommend this hotel to anyone. Plus, the neighborhood guests stood outside their rooms drinking from a bootle, and smooked. Not the best PR... I will never return! Thank you for your feedback. I apologize that we failed to exceed your expectations. I hope you will reconsider giving us another opportunity to serve you in the future. "Decent Stop for a Quick Trip"
Needed a place to stay while we were visiting family. As a result we weren't in the hotel often. Parking was easy, location was pretty good, friendly staff and a clean room. I really appreciated the extra lighting in the bathroom. The bed and armchair were comfortable. The one significant downside to the property was that it is not easily entered or departed from. It's a bit tricky to get in and out from the street. If you approach from the 'wrong' direction you have to make a confusing U-turn. This is a fairly attractive older property that seems well kept and updated in some ways. The room was requested on the first floor (of 3) and this was accommodated. It was quite spacious with two queen beds. The beds gratefully were not made up with heavy, reused covers. Instead, white thermal blankets were accessorized with strips of heavy fabric at the foot of each bed. I'm assuming the thermal blankets were removed along with sheets for laundering. A refrigerator, microwave, and small coffee pot were in the room, as well as an ironing board - I didn't notice an iron - but I wasn't looking for it. Upon entering the room, a most horrendous odor strongly permeated the air - something like a lot of very unclean people had imparted their odors onto everything in the room. I didn't complain because I was too tired to move. The next day, I figured out that turning on the a/c would take care of the odor. It was probably the worst smelling hotel I've ever encountered - initially, and I've reviewed this on the hotel website, so, hopefully, management and housekeeping will address this extremely unpleasant issue. More good things - the pool and spa each included handicapped accomodations for lowering guests into the water. Many people enjoyed the pool until 10 p.m. If you don't want to hear people having fun, request a room away from the pool. Breakfast is available from 6:30 - 9:30. Food quality was mediocre, coffee was good, and breakfast staff cordial and helpful. Internet is available with a code - I didn't try using it. This hotel bills itself as a conference center. A nice, large room used for breakfast service is referred to as the conference center. Perhaps there are other accommodations, too, for this purpose. Sign up for the Best Western rewards and receive a nice discount on the room cost. 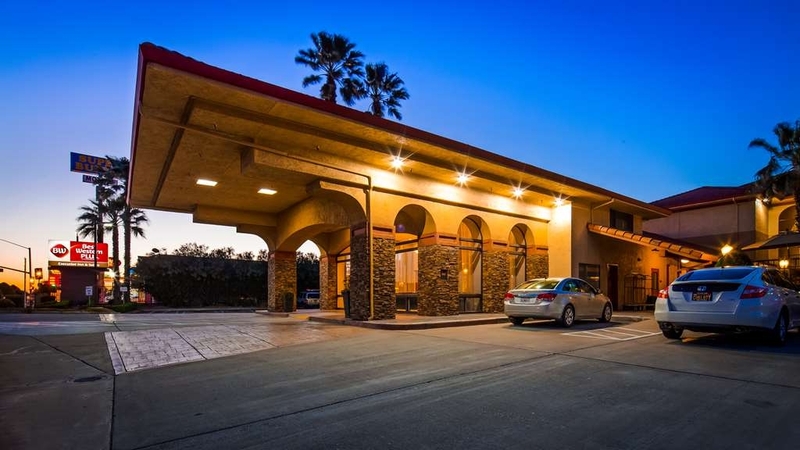 This hotel is extremely convenient to the CA99 freeway - immediately at the exit. Overall, this turned out to be a good place and I would stay again - and turn on the a/c before breathing! "A solid three star. Pros and Cons." We stayed here with our family of four over the weekend because we had a baseball tournament. Pros: Easy and nice people at check in. Received extra blankets, pillows, and towels as request. Breakfast was nice and breakfast room was remodeled and updated. Breakfast room had TV with the news and was very clean and well kept. Front desk had change so we could wash baseball jerseys over night. Cons: The hotel rooms were dated and a little dark. The hotel was close to the highway and a busy street. We had an interior room so I didn't hear any traffic. Surrounding area is just ok. The washer/dryer were located in the second floor and I was worried my clothes may go missing... but also they had security (who was nice) walking the property at night. Overall- not bad (depending on your room rate.) It was ok for a quick overnight stay where we only slept and stayed for a short time. Basic motel, clean, decent but the immediate area is covered with strung out druggies wandering the street, some very zombie like........ Pool closes early which is bad if you are there for a baseball tournament and have the late game on a hot night. Thank you for your feedback. I was pleased to read that our hotel met most of your needs other than the pool hours. I apologize for what you experienced in the areas around our hotel. I hope you will consider giving us another opportunity to serve you in the future. Very nice. Very clean! Comfortable! Great staff that were very nice, very friendly. Loved my stay here. Would stay again. Traffic is on both sides but traffic will always be around a hotel. But lots of shopping around and things to do. Close to dog park. "Typical old style Inner city hotel"
Our room faced the freeway interchange- vehicles accelerating hard all night long- bring ear plugs. Staff were friendly and the breakfast was good. I said old style hotel (or motel) due to the entrance to the rooms being off a balcony style walkway. Others walking past can see in your room so you have to keep the blinds closed. Good for one night only. Many restaurants nearby though. Convenient location, it's not as far from I-5 as it looks. Many great food/ restaurant options nearby, nice big breakfast area, friendly staff. Outdoor pool was great for the kids. We will stay again. Good price for the accommodations.. This motel was clean, it had a great pool, great location, but the breakfast was over the top! It was a breakfast buffet, not just free coffee and rolls. The staff were very helpful. Totally recommend it! "Nice place to stay in Manteca"
Another BW stay on this trip. More modern lobby. Clean property. Good staff. Would be really nice if some adult time is given for the pool area. But the screaming kids are allowed until 10 so no time for adults to use spa and relax. Too bad, really. Very nice breakfast area. Good food and nicely cared for to keep the food hot, plentiful. The noise from the pool does travel between the buildings. The east facing rooms gets noise, from the freeway. Ceiling fan, a wonderful idea. Spacious king room. We stayed here as a stop for the night as we were heading home. It is easy to get to. We did not have any problems with noise. The room was nice and clean. WiFi was great. Breakfast was okay. I did not care for the eggs. They had no flavor and tasted like they were made from powdered or reconstituted eggs. We would stay here again. Thank you for your review of the Best Western Plus Executive Inn & Suites. We appreciate all of your positive feedback. I am glad that we were able to make you comfortable after your husbands surgery. However, I am sorry that we were unable to earn a higher rating. I hope you will consider giving us another opportunity to serve you in the future. "Very loud outside noise but decent facility "
Nice large bfast area, pool clean. Small workout room, very stuffy. Staff was all super nice from check in and out, and bfast ladies. Room had plenty of room but faced the road and was crazy loud. I downloaded a white noise app to help drown out the sound. Bed ok. Hot water at night and morning with no issues. Thank you for your review of the Best Western Plus Executive Inn & Suites. I am glad that our team has been helpful to your and our hotel is a convenient location for you. I was pleased to read that you liked our new fitness room as well as our new breakfast room. I hope you will choose our hotel again next time you are in the area. We stay here twice a year and it is always a positive experience. A;though we stayed on the freeway side this year the noise did not bother us. This year they moved the breakfast room. It is large, warm and welcoming a nice addition. It is easy to get on/off highway 99. Thank you for your review of the Best Western Plus Executive Inn & Suites. Thank you for being our guest twice a year. I was pleased to read that you enjoyed our new breakfast room. We look forward to your next stay. My request for a quiet room has been met each time I've stayed. The staff is friendly and helpful. The rooms are clean and comfortable. It's perfect for a solo get away. I look forward to my next visit! Thank you for your review of the Best Western Plus Executive Inn & Suites. I am glad that our team meets your needs and our hotel is comfortable for your solo get away. We look forward to your next visit as well. I stay here every year for a fourth grade field trip to Jamestown and Columbia State Historic Park. Always clean, comfortable accommodations. Close to a wide variety of food options, next to 99 Freeway. Excellent breakfast and nice workout room, pool. Thank you for your review of the Best Western Plus Executive Inn & Suites. Thank you for choosing our hotel every year during your trip to Jamestown and Columbia State Historic Park. I am glad that our hotel is comfortable and meets all of your needs. Also, I was pleased to read that you liked our new breakfast room and fitness room. We look forward to your stay next year. "Booking was amazing...looking forward to seing if the rest of our stay is as well." So I haven't seen or stayed at the hotel yet however, I called to see if there was anyway to stay in the same room since plans had changed and I had to book two consecutive days on two separate third party sights. The nice young woman who answered named Teilor let me know it was already taken care of. I was astounded because, I hadn't even told her my name yet. She said it's okay that when she notices the same name on consecutive nights booked on third party sites she automatically puts the guest in the same room. HOLY COW! Someone who thinks ahead and looks out for the guest! It's been a very long time since I've seen forethought and the drive to go that extra step when doing their job. KUDOS to you Teilor. THANK YOU! Hopefully the stay there is as amazing as the booking. Hotel is in a good spot with resteraunts all around. Close to the ball park if youre going to play ball. Price wasnt to bad the suite rooms are a good size for couples and additional people with a roll out bed. Water in shower was warm. Could use more towels in the suite room is my only complaint. Hotel amenities and property is well kept and attractive. Special requests were conveniently communicated via email. Breakfast was one of the best I've had in a hotel for years! Your staff is efficient, courteous and friendly. Thank you! Wonderful staff and nice hotel overall. The breakfast was good. I had no problems with the internet. I may stay here again the next time I'm in the area. Restaurants and shopping near by. The price was reasonable. "Love it my family really loved it here I would most differently tell other family and friends about this location"
This was not a nice hotel. Best Western has really fallen off. I would not take my family here. It was loud. The room was not clean and the sink didn't work properly. The staff are nice, but I was ready to get out of there. Thank you for your review of the Best Western Plus Executive Inn & Suites. I apologize that we failed to meet your expectations. The sink drain is a push button style. I will share your review with our housekeeping staff so we can focus on improving. I hope you will reconsider giving us another opportunity to serve you in the future. "Good Stay, Nice Staff, Good Room"
Thank you, icabod353, for your review of the Best Western Plus Executive Inn & Suites. I was pleased to read that our hotel met all of your needs and you liked it enough to come back. I hope you will choose us again next time you are in the area. We booked this hotel to attend a family reception, arrived at 3:00pm in time to change and go- when we got to our room the smell of smoke was very strong, we opened the one window that did open changed and left, upon return it was late, the smoke smell was awful but the room was right outside the hot tub, we were told the hot tub opened at 9:00 am perfect for before we had to leave in the morning- wrong it didn't open until 10:00 this didn't work for us. My husband has a prosthetic leg and needs to take it off and use crutches to go to the pool/ hot tub. There was a broken tile area outside our door, very dangerous for heels or crutches. We didn't use the hot tub. There was a used wash cloth hanging in the shower, the carpet was dirty. The heat/ cooling units were filthy and the front was partially off- they worked I guess that is a plus. We should have asked to change rooms but we were rushed. Upon check out I mentioned to the person at the desk the smoke issue and the used washcloth over the shower curtain, she said she would have housekeeping do a better cleaning, really, no I'm sorry, no would you like to speak with the manager, just my receipt. We felt like we were in some sleepy motel, please note the manager reached out and apologized and offered a discounted future visit, I don't know if I will chance a future visit, maybe they were just off or something, maybe I will to give them a chance at a better review in the future. Last note, the breakfast that is included was a plus to this stay, we both had sore throats after being in that smoker room it was awful. Thank you for your review of the Best Western Plus Executive Inn & Suites. I am very sorry that we failed to provide you with a good experience. I did speak with our housekeeping department about the issues you had previously mentioned to us. The reason for our pool hours are the fact that it is located in the middle of our hotel and we don't want people in the pool to disturb guests trying to sleep in. I am sorry that this did not work out for you. I really hope you will take me up on the offer of the discount on the future stay so that we can have an opportunity to change your opinion about our hotel. "Love to make your bed?" If you like cleaning your own room this is the perfect hotel for you. We were there for 4 nights and only twice did they clean our room. When we complaint they asked if we had left the no disturbing sign on the door. Our answer was always no. Other disturbing issue: once we arrived at night at the hotel and there was a homeless man sleeping in the elevator. No more "best" Western for me. Thank you for your review of the Best Western Plus Executive Inn & Suites. I apologize that our housekeeping department failed to meet your expectations. Our housekeeping supervisor checks all stay overs throughout the day and did note it on her paperwork that your "Do Not Disturb" sign was on the door. When this is on the door our housekeeping department skips the room for the day. I apologize that this was not communicated to you. I hope you will reconsider giving Best Western another opportunity to serve you. "Not the usual standard of Best Western Plus"
Breakfast was very poor. Not even butter available just margarine. Coffee was not drinkable Hotel looked like an old motel. No lobby or reception area. Rooms were clean. Staff was trying their best and were nice. Thank you for your review of the Best Western Plus Executive Inn & Suites. I apologize that we failed to provide you with a good experience. I will share this review with our breakfast staff so we can improve for future guests. We have finished our lobby renovations and our new breakfast room and lounge area will be opening very soon. I hope you will consider giving us another opportunity to serve you in the future. "Remote didn't work smelled like weed"
Price was ok but room smelled Like weed. TV remote didn't work requested a new one. Still didn't work properly. One Trash can wasn't emptied and the sheets had a few stains. Breakfast was good but a very small room. Definitely a place for construction worker, semi tuck drivers to stay at. Thank you for your review of the Best Western Plus Executive Inn & Suites. I apologize that we failed to provide you with a good experience. I will share this review with our housekeeping department so we can improve for our future guests. Also, we will be opening our new breakfast room very soon. I hope you will consider giving us another opportunity to serve you next time you are in the area. It was a very good experience. I like the BW hotels. I stay at them as much as I can when they are in the areas I visit. I travel for work. Satff is always nice and accomodating. I always find a descent BW in every city I visit. Thank you for your review of the Best Western Plus Executive Inn & Suites. I am glad that your enjoyed your stay and had a good experience. Also, we appreciate your loyalty to Best Western. I hope you will choose us again next time you are in the area. "Terrible traffic and freight train noise. Very surprised that this wasn't mentioned in more of the reviews. Motel is dir"
surprised that the very disturbing noise wasn't mentioned in more reviews—property is directly adjacent to freeway. Many rooms face the freeway. Very poor water pressure in shower. Non-smoking room smelled strongly of cigarette smoke. Thank you, E4557SN, for your review of the Best Western Plus Executive Inn & Suites. I am very sorry that your stay was not up to the standards you expected. I have shared your review with our maintenance staff and housekeeping staff so that we can work on the issues that are in our control. I hope you will consider giving us another opportunity to serve you in the future. We have stayed here often when working on a retreat in Stockton. Only minor complain is the air conditioning is very noisy. Otherwise is a good hotel for its value. Staff is very friendly and kind. Breakfast staff are especially friendly and keep the area well stocked and clean. 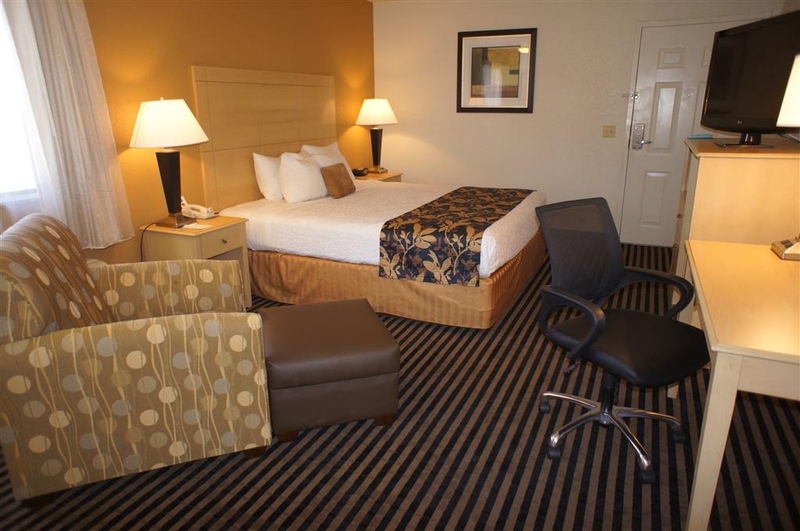 Thank you, ecejeanne, for your review of the Best Western Plus Executive Inn & Suites. We enjoy hosting your group while you guys are here for your retreat. I am glad that we have been able to meet your needs and I hope your organization continues to choose us. This is a fairly large Best Western conveniently located just off the freeway. The outside and room appearances were very nice and clean. The bed was comfy, and breakfast more than adequate. All the staff were helpful and polite. They take security seriously since we had to use our key card to access our room hallway — I appreciated that. We were just passing through but were glad we spent the night here. Thank you, Nancy C, for your review of the Best Western Plus Executive Inn & Suites. I was pleased to read that our room was comfy for you and you enjoyed our breakfast. I hope that you will choose us again if you are every passing through the area again. "Room Location, location, location !" Your enjoyment of this motel is likely to hinge on the location of your room. There are twin blocks that make up the accomodation area and the position of your room is vital. Several adjacent local streets and an elevated freeway interchange mean that road noise is a real issue. There seemed to be a continuous roar of traffic all evening, late night and early morning when I stayed. Police and ambulance sirens, screeching brakes, revving engines and honking horns were the currency of the area. My room was on the inner courtyard section of the block farthest from the noise so luckily I was somewhat insulated. It would be a different story for rooms facing the action, and those on the upper third level which would be much more more exposed. Once inside I found the spacious room to be comfy and well appointed. The bed was particularly good. Lights were plentiful. TV was fine with a good selection of stations. The bathroom however was disappointing, sporting my pet hate; a shower curtain above the bath which was incapabable of preventing the shower water from overflowing onto the floor. Both bath and loo water were slow to drain making it difficult to keep either clean. The check-in staff were friendly and helpfull and there a few monitors and printers in the entrance area for those who need them. 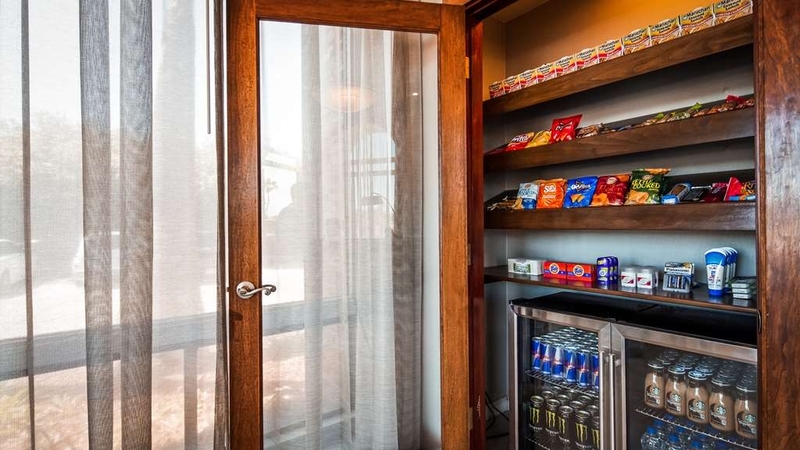 A small breakfast room is located behind the lobby where a reasonably extensive selection by American standards is available. However it wouldn't in any way compete with a local diner or breakfast bar. The immediate compound is clean and well maintained but outside at night where the local area has a few market shops and a liquor store there is a slightly down market vibe. My one night stay cost $140 which seems expensive for what was on offer and completely unacceptable if I was to be subject to the traffic bombardment on the wrong side of the motel. So if you're staying be prepared to insist on room selection! A week earlier I had stayed at the nearby Travellers Inn for $70 and while the general standard of quality was lower it has to be said that I had a quiet and comfortable night. A Continental breakfast was supposed to be included but there was no sign of anything when I left at 8;30am, however $14 in Johnnie's Diner down the street had me fully satisfied. Even including that extra cost this unpretentious and friendly place saved me over 50 Bucks. The choice is yours! 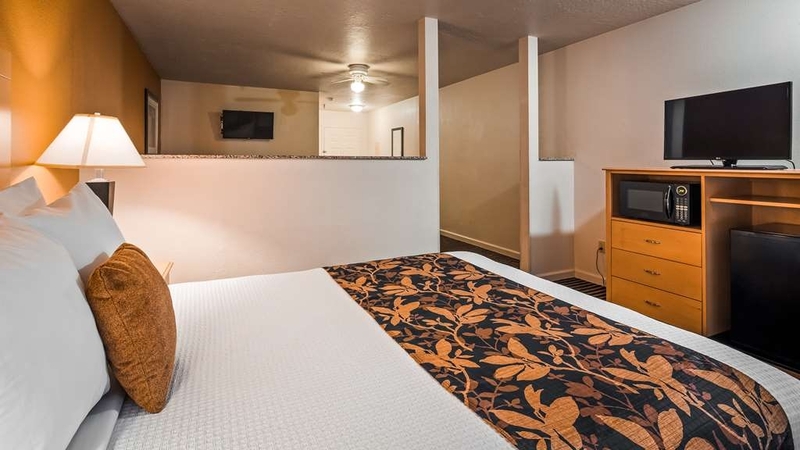 Thank you, AchilHiker, for your review of the Best Western Plus Executive Inn & Suites. I am glad that our room was spacious and comfy for you. I apologize that you didn't seem to enjoy the rest of your stay with the issue of the shower curtain and the traffic noise. There is a free breakfast provided every morning in the star room behind our pool. We do inform everyone at check in as well as have a sign in the walkway. I apologize that we seem to have failed at communicating this to you. I hope that you will consider giving us another opportunity to serve you in the future. The service at this hotel is amazing. All the employees were very helpful; they went out of their way to make sure we were happy with our rooms. The rooms were clean and well stocked. This hotel sits across the street from a shopping plaza, so there are many food choices for dinner. Everything was fine, check in, amenities, room and bed, breakfast very good, except from the noise. Hotel is located next to freeway and freeway entrance ramp, means a lot of constant noise. Cars, bikes & trucks all night long. We could barely sleep, terrible night, room not insulated at all. Extreme noise, far from acceptable noise level. Result: Most important thing as sleeping was not possible. Not recommended. "Average hotel with a good breakfast." The best thing about the stay here was the breakfast! It was definitely one of the better free breakfasts we've ever had. There are a lot of truck drivers and construction workers that stay here so it is incredibly noisy and busy throughout the night and early morning. The sound of trucks staying and pulling in quite us up several times throughout the night. Most of the rooms are accessed from outside so the smell of smoke and marijuana got old. I probably wouldn't ever stay here again, but it wasn't dirty and the breakfast ended the stay on a nice note. It was a very nice Hotel,we have stayed there before. 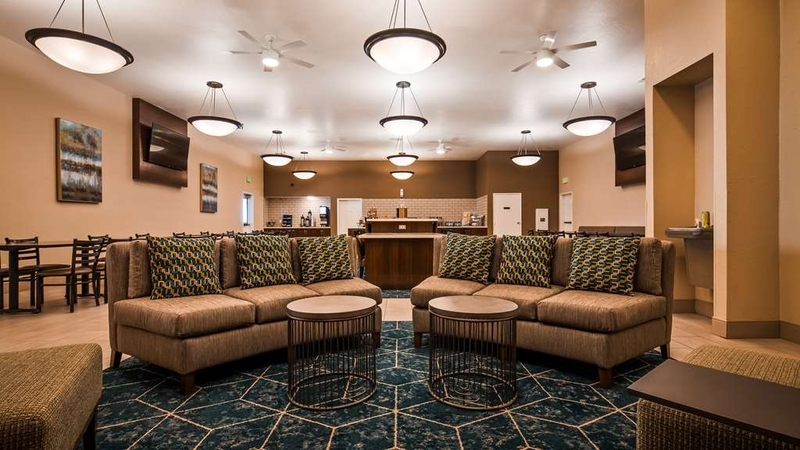 When we travel we try to stay at Best Western,we like them the best.We are staying at Best Western next week in Ontario Oregon .I will tell my friend about Best Western ,how good it is. This was the first time I've ever stayed in Manteca. The hotel is very convenient. It's right off the freeway with tons of restaurants, fast food and stores near by. I was attending a softball tournament at the Manteca softball complex (Big Leauge Dreams) so it was not far from there (less then 10 minutes away). The hotel room and grounds were very well kept. The staff was very friendly and on it anytime you need something. The breakfast in the morning was good. I would definitely stay again. The only bad thing I have to say about the hotel is the mattress was not too comfortable but other than that their stay was great! I stay at this hotel 5 days a week and been doing so for almost 8 months. The staff has always been very helpful and caring, and always help[ed make our stay much enjoyable when ever possible. The property is always very well maintained and taken care of. The rates seem quite reasonable and fair. I would recommend this hotel to anyone looking in manteca. 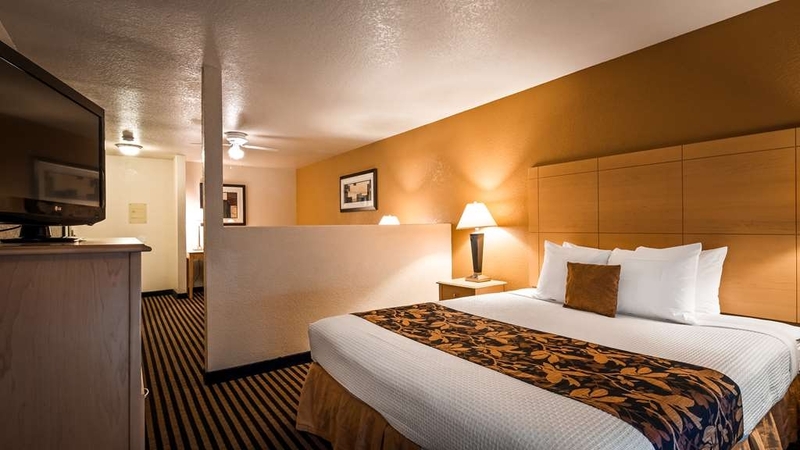 Thank you, maximob421, for your review of the Best Western Plus Executive Inn & Suites. I am glad that our staff has continued to take care of you and make your stay enjoyable. We look forward to your continued business. "Maids don't clean that well"
The balcony wasn't clean. There was empty beer cans, cigarette and blunt buds on the table. They were trying to switch us rooms to the one next door but then I saw the other one next to us also had food wrappers on that balcony. 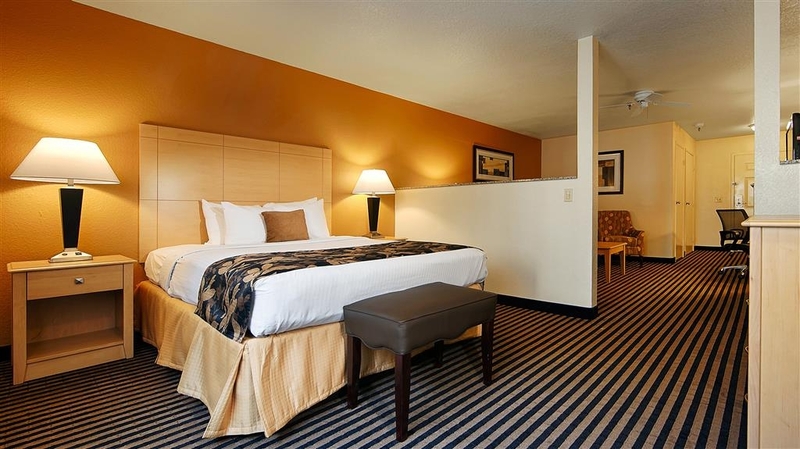 Thank you, ericalI111SF, for your review of the Best Western Plus Executive Inn & Suites. I am very sorry that the balcony wasn't cleaned prior to your arrival. We did have a newer housekeeper in that section who had not had balcony rooms assigned to her before. I have shared your review with our housekeeping department so we can prevent our future guests from having the same experience. I hope you will consider giving us another opportunity to serve you in the future. "Seemed a bit worn, never judge a book by the cover"
The breakfast host was wonderful. We actually had stopped at another hotel in the area and walked out due to cleanliness and location issues. This Best Western appeared a bit dated, but we had a comfortable stay. Thank you, Jeremy B, for your review of the Best Western Plus Executive Inn & Suites. I am glad that our hotel met all of your needs. I was also pleased to read that you felt our breakfast attendant was wonderful. I have shared your review with our breakfast attendant as well. I hope you will choose us again if you return to the area. Not a grand escape but clean. Large facility with a lot of rooms and a lot of people around. Rooms are quiet, small, dank furnishings but with good beds and overall good cleanliness. I don't go to this town often, might stay again. Thank you, Bmac68573, for your review of the Best Western Plus Executive Inn & Suites. I am glad our hotel met all of your needs. I hope you will choose us again next time you come to town. Came to town again. We stayed at this location again because we have not had a bad stay here. When we got to our room, we found a dirty sock in the corner. It was not ours. We also noticed the door bulged at the bottom. No problem, we could live with this for three days. Went to bathroom and had to force our way back out. Busy weekend, no other rooms. We would try to work with it. Door was sagging, not plumb and paint was rubbing. Day or night you heard "Clump! Squeak!" Bathroom is open! You can even hear it over the jet powered air conditioner. Morning came. Breakfast time came. Dining area has been moved to the Work out room. You even can see the sauna. Room has nine tables with 18" aisles. Both doors to pool partly blocked. Constantly has 25-30 people milling about. Does not appear to comply with ADA or fire code. Third day, we were in the room in the morning. We went out around 1:30 PM after calling for housekeeping. We came back in a couple of hours to no clean room. We left again and came back to a pile of towels and nothing else. Guess that did not work. Check out went well. Thank you for your review of the Best Western Plus Executive Inn & Suites. I am very sorry that we failed to meet your expectations. Our fitness room was converted into a breakfast room about fifteen years ago. At the time it met all of our needs. However, it no longer does and we are currently in the process of converting our large meeting room into a breakfast room and will be converting the breakfast room back into a fitness room. Our property does comply with all codes and we are inspected annually to insure compliance. I hope you will consider giving us another opportunity to serve you in the future. The hotel is not easy to get into due to the roadway in the area but the staff and rooms are at the top of the game. would stay here again if was in the area. Described eating options which was very helpful. Layout of the room was very good. Stopped here for a night after going to Yosemite during the day. The hotel staff was friendly and helpful even though we arrived late. The room was spacious and clean. Internet was great. I felt like the hotel was a great bargain for the price. I just read a review about unchanged sheets andI also don't think the bed sheets were changed on our stay. The sheets seemed to be either dirty or stained. We arrived pretty late after a long day of hiking in Yosemite. I was too tired to deal with this issue so I just wore a layer of extra clothes and slept on top of them. Other than the sheets, the room was fine. The breakfast was average but they are strict about shutting it down at closing time. I saw a family get turned away. The man at the front desk when I check in was nice. I asked that the two rooms that I rented be located close together and he did so without any problem. "The room was tired and broke down. Extremely noisy"
The sink was clog, the ceiling wobbled like it was going to fall off. The overall condition of the place was worn out. The condition made me think I was staying at Motel 6. The room was not well insulated because every noise passed through the walls. The front desk was OK but not very helpful. Luckily wE only stayed one night. 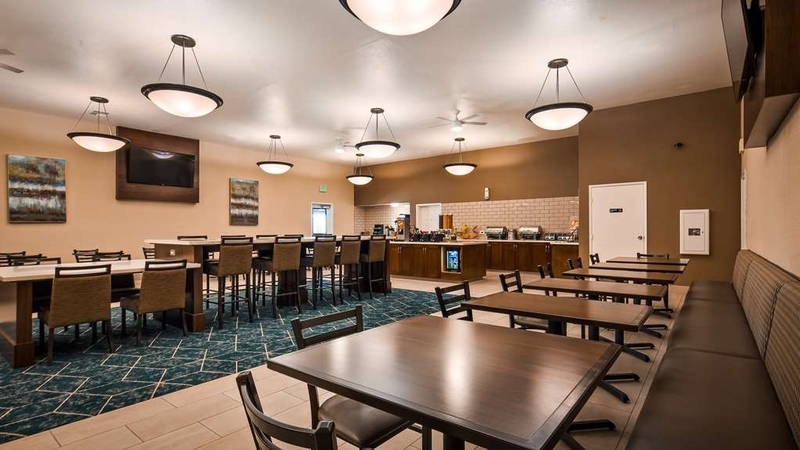 "Convenient location for Baseball Tournaments"
We have stayed at this Manteca, CA location on a couple of occasions and the property is quiet and clean and in a convenient location near Big League Dreams Park as well as fields in neighboring Turlock, Tracy, and Modesto. Restaurants conveniently located along same street. Great value and always see similar sport families. People come to sleep in hotel beds, please make sure that the beds are clean. Our bed sheets had a funny perfume scent and I felt itchy the whole night. After I reported to the front desk about the dirty sheets, the turn down service just fixed the bed without changing the sheets! My long hair was still in between the "new" sheets that I slept in with the funny perfume scent. We have twin infants so looking for a hotel that had a crib option was a plus. Please let your customers know that there isn't a crib available if we requested a crib in advance. We had a queen suite and room was big and clean, I really like having the wall divider between beds, gives a sense of privacy. The hotel staff was awesome and very helpful. The pool was alittle small. Basic hotel room. Clean. Bed a little small. Nothing special. High proportions of patrons with tatoos and nose rings. Soda machines did not work properly. Staff was good. Good place to stay if you need to be in the area. I thought all the people slamming doors all night long were being rude, until I tried to close the room door and the outside door quietly myself. The latches were just LOUD. Made it very hard to sleep. Not helping - half-size, dense pillows. The toilet wouldn't flush all the way and the toilet paper was cheap and thin. Not worth the price. The hot tub was so chlorine-y that it stung your eyes and you couldn't stay in it. Thank you, thejelineks, for your review of the Best Western Plus Executive Inn & Suites. I apologize that your stay was not enjoyable. We do balance our pool and spa chemicals daily to ensure it is at approved operating levels. I will share your review with our team so we can focus on improving for our future guests. I hope you will consider giving us another opportunity to serve you in the future. Our previous stays at Best Western hotels have been positive. This location was not. Granted, our visit to family was stressful and the temperatures were record highs, but our room was overdue for replacement/repair. The staff were friendly and helpful as much as they could be within their powers. No other ground floor room was available. The breakfast staff were limited to what was available to them. The A/C was working hard but couldn't compete with the heat. 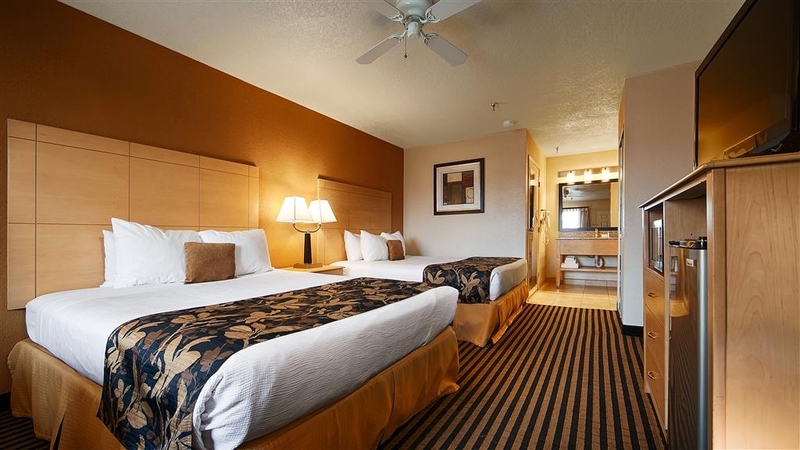 Thank you, johntL2339QT, for your review of the Best Western Plus Executive Inn & Suites. I am sorry that your stay was not up the standards you would expect from a Best Western hotel. We will use your review as training and focus on improving for our future guests. I hope you will consider giving us another opportunity to serve you in the future. Thank you, petersR1316EX, for your review of the Best Western Plus Executive Inn & Suites. I was pleased to read all of your good comments about the hotel. I am glad you enjoyed your stay and thank you for the recommendation for future guests. I hope you will choose us again next time you travel to the area. Check-in was not smooth -- the clerk didn't seem to know how to handle points and had to call some one. The room seemed a little dingy and there was an odor in the refrigerator. The breakfast was decent but the room was too small to handle the crowd on a Sunday morning. 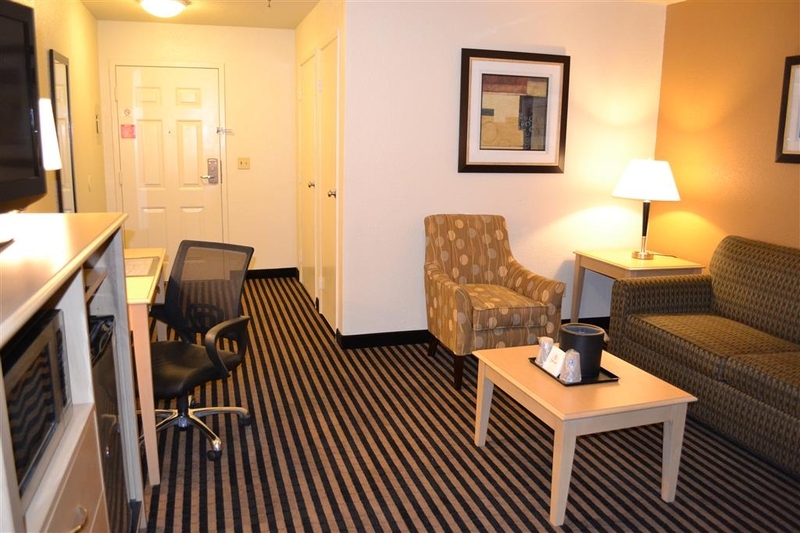 Thank you, T5940NUdavidh, for your review of the Best Western Plus Executive Inn & Suites. I apologize that your stay was not up to the standards you would expect from a Best Western hotel. We do have many new hires that we are still developing and we will continue to focus on improving for our future guests. Also, we will be adding a larger breakfast room later this year. I hope you will give us another opportunity to serve you in the future. I am a BW Platinum Elite and usually am treated very well by most all facilities .. Tailor at BW Executive suites in Manteca Ca. is a very rude , sour person .. have stayed there many times and every time she is there I am treated rudely .. Thank you, Ken L, for your review of the Best Western Plus Executive Inn & Suites. I apologize that you have not been satisfied with the service at our location. I will use your review as a training tool for Teilor so we can focus on improving for our future guests. I hope you will continue to choose our hotel in the future. "Booked an adjoinging room that was not cleaned"
Thank you, bonnieag, for the review of the Best Western Plus Executive Inn & Suites. I am very sorry for what you experienced during your stay with us. I have shared your review with our housekeeping department and we will make sure this kind of mistake doesn't happen for our future guests. I hope you will consider giving us another opportunity to serve you in the future. 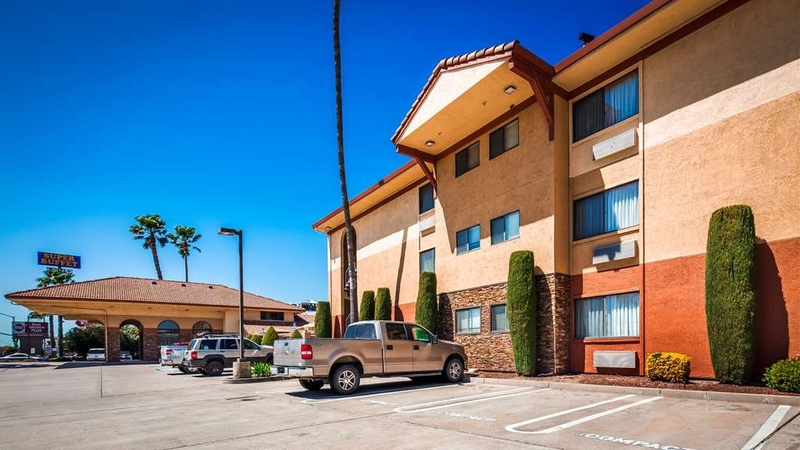 Best Western Manteca -Location: Corner of HWY99 & E Yosemite Ave/Rte 120. This provides prompt access to/from major routes. One drawback is that it is located on an avenue separated by a median which requires no left hand turn entry/exit. One is required to pass to the next intersection and perform a legal U-turn, which is allowed. Gas stations, fast food, restaurants, and shopping are all nearby, accessible by foot or car. -Arrival: There is one driveway in/out of the property, which can be accessed from E Yosemite Avenue. It is located immediately after the yellow fire hydrant. There is very minimal guest parking near the front office, but alternatively, there's ample employee only parking right by the entry. -Check in: Staff was polite, however, stopped the check in process when an employee came to the desk and interrupted, requesting their paycheck. Instead of finishing with the customer, staff took care of staff, even when there was a problem finding the paycheck, causing further delays. -Parking: this is a courtyard style square building with parking surrounding it, yet it is limited in some areas around the building. If you're towing or driving something big, there's not a good deal of space for you to navigate if you need to get around. There were several times I could hear someone's backup alert beeping repeatedly on and off whilst they tried to pull forward and back, forward and back, trying to get around the lot. -Elevator: To my knowledge, there is one single elevator car to handle three floors of rooms for guests, maid staff, and maintenance. -Maid service: I did not take advantage of this service. The room, however, appeared clean upon arrival. -Security: Although there are some locked (keycard) exterior entrances which I noticed on one corner of the building, I failed to see why since there are open air breezeways with access from the parking lot and the majority of rooms seem to have exterior, unsecured entrances. In addition, I spotted secured entrances left propped ajar several times during my stay with no one in sight. This seemed to defeat the purpose. Parking lot is unsecured. -Noise: Due to the exterior entrances and breezeways, the noise from vehicles simply driving and revving, as well as the nearby railway (which runs day and night), the sounds bounce off the structure interior and exterior and reverberate day and night. There is also a large adjacent lot in which eighteen wheel trucks park out overnight and leave their engines running whilst the drivers sleep. I could hear their engines idling while wearing earplugs and having the A/C in my room running which tells me the construction quality of the hotel is extremely poor. -The Room: I booked a suite with a king bed, sofa bed, easy chair, computer desk and chair, coffee maker, microwave and mini fridge. All were clean and the furniture was comfortable. The room was of good size. I was in room 336 and reserved for five nights. There was a sizable gap underneath the room entry door. One bar of soap was provided for the room which one must pass back and forth between shower and sink, as needed. No shampoo or conditioner was provided, but there was body lotion and two packets of alcohol free moisturizing makeup remover wipes. Not really sure what to do with that information. Maybe they're really concerned about dry skin? Lol. The toilet ran intermittently. The sleeping area and living area were separated by a vertical half wall. There were two televisions, one in the bed area, another in the living area. This was nice since some hotels skimp on this and one cannot view the single television from either the sleeping area or living area. Not an issue here. -Pet Policy: Pets were allowed here. And barking could be heard. -Pool: It was open during the time booked. Other guests appeared to enjoy it greatly. My teen nephew visited me and went down to the pool briefly and had no complaints. -Free Breakfast: I did not take advantage of the free breakfast. Frankly, I have no idea where I would have gone for that. During check in, one walks into a small lobby with a few chairs and is blocked from going any further by the front desk. So that's just basically a check-in room, if you will. There's no access to the rest of the hotel from there. The gentleman behind the counter didn't mention the free breakfast which was advertised on the website (Orbitz) as well as the hotel website. The only map I was shown of the facility was whipped out briefly to identify for me my current location, the elevator, and my room destination. So, the breakfast location would've been guesswork. Maybe there's banana trees on the property. -Cost: I was billed $141.59/avg per night via Orbitz. It wasn't worth it for me primarily based on the extreme noise of this location which equals lack of a restful stay. Thank you, 773melindak, for your review of the Best Western Plus Executive Inn & Suites. I am very sorry that you had a negative experience while staying with us. Unfortunately, we are land locked and there isn't anything we can do about our entrance or the freeway and parking lots next to us. However, there are many issues you mentioned that we can take care of. I will share your review with our housekeeping staff to insure they are stocking the rooms correctly. I will also share the review with our front desk staff and make sure they putting the customer first and giving them all of the information about our property. We will use this review as training and focus on improving for our future guests. Once again thank you for taking the time to let us know about your experience. Nice room, I felt it had a bit of a dog odor, and we had asked for a room no animals had stayed in because my husband is alergic. My husband said he could not smell it and besides the hockey was on and he was focused in that. Thank you, 62geraldf, for your review of the Best Western Plus Executive Inn & Suites. We really appreciate you taking the time to tell us about your experience. I am very sorry that the room had a bit of an odor, however, I am glad your husband was able to enjoy the hockey game. I hope you will choose our hotel if again if you ever return to the area. Staff very helpful and professional. The room had gum or something sticky on the floor but the bed was comfortable. Came at end of the breakfast, there was not much left or they had ran out of some of the food items. Thank you, Ann M, for your review of the Best Western Plus Executive Inn & Suites. I am sorry about the floor and the breakfast problems. I will share your review with our breakfast and housekeeping department so we can focus on improving. I appreciate the good comments about our staff. I hope you will give us another opportunity to serve you if you take another California trip. Shower head leaks, nonsmoking rooms smell like smoke, breakfast is worst than microwaveable dinners. Breakfast eggs tasted rubbery, yogurt tasted like cardboard. They downgraded my suite to a regular room bc the suite smelled like smoke and walking into the standard room it still smelled like smoke! Thank you, Wendy L, for your review of the Best Western Plus Executive Inn & Suites. I apologize that we failed at providing you with a good experience. I will share your review with our staff so we can focus on improving. I hope you will consider giving us another opportunity to serve you. If you are traveling with friends or family this is the hotel you would want to book. I was all by myself but having had the experience of traveling with others this is the room I would want to be in. 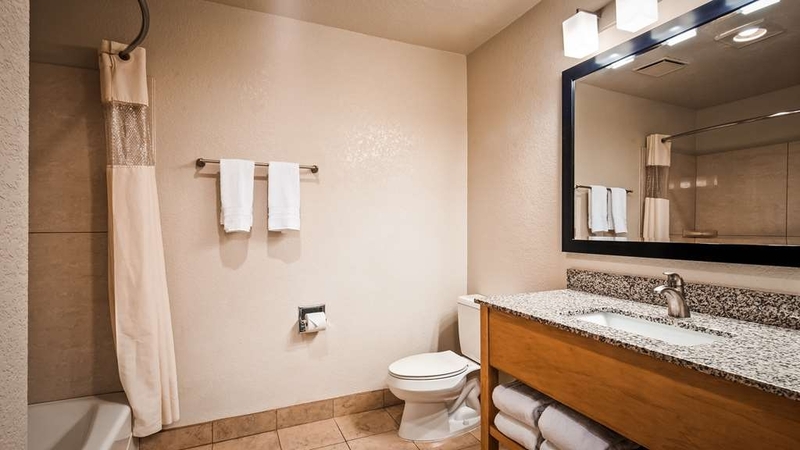 Thank you, Christina M, for your review of the Best Western Plus Executive Inn & Suites. I was pleased to read your good comments. Has everything you want. Was our base to see Yosemite National Park. Clean rooms, decent breakfast, even a small pool. Good location too as have a few food places next to it and across the road. Not much to see apart from Yosemite though. Thank you, IrfanBhai, for your review of the Best Western Plus Executive Inn & Suites. I was pleased to read that our hotel met all of your needs during your Yosemite trip. I hope you will stay with us again if you ever visit Yosemite again. We really enjoyed the swimming pool, hot tub, laundry facilities and free morning breakfast. The hotel is located close to restaurants, shopping, and the highway, so it was easy to travel back and forth to our little league baseball tournament. 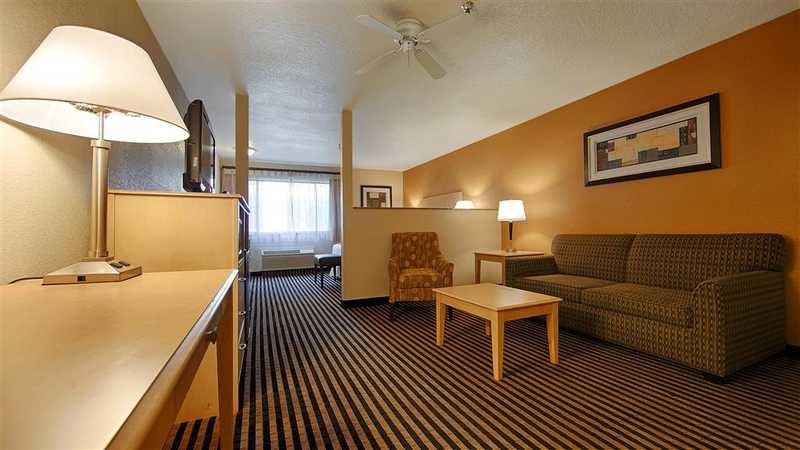 Thank you, S6035CKjennifers, for your review of the Best Western Plus Executive Inn & Suites. I was pleased to read that you enjoyed our facility and that our location was convenient for you. I hope you will stay with us again if you return for another baseball tournament. "Untrained staff and lack in control"
When I got to the hotel around 3 in the afternoon, I was in no rush to get my room. After waiting about 10 minutes - no bother at all - I was served by a friendly clerk who handed me the keycard and told me the room now was ready for me. I got to my room, and found it was not ready at all. No sweat. I go down to front desk - had to carry my luggage back down there again - and got keycard for another room. The room was nice and I had a night as quiet as can be when it turns out the hotel is neighbor to the freeway. I was to stay three nights. Upon returning around 8 the night after, my keycard did not work. I had to return to reception to get the card reactivated. No excuse, no explanation, just a quick swipe of the keycard by the clerk, and I got the card handed back to me. Fortunately I have the habit of locking my door and making sure the security lock is activate. Because a little less than an hour later, someone tried to access my room, using a keycard. Luckily, it did not open my door, but the person was quite persistent. I had to call security to get him go away. Afterwards I called front desk and informed them of the "mishaps". Again, no excuse, no explanation, just a self-defensive front desk clerk who made it clear this was not her fault. Well, I don't see it was mine, either. Checked out one night early and found another place to stay. Did not feel safe in this place. Very uncertain of what would be the next trick played on me by the front desk here. 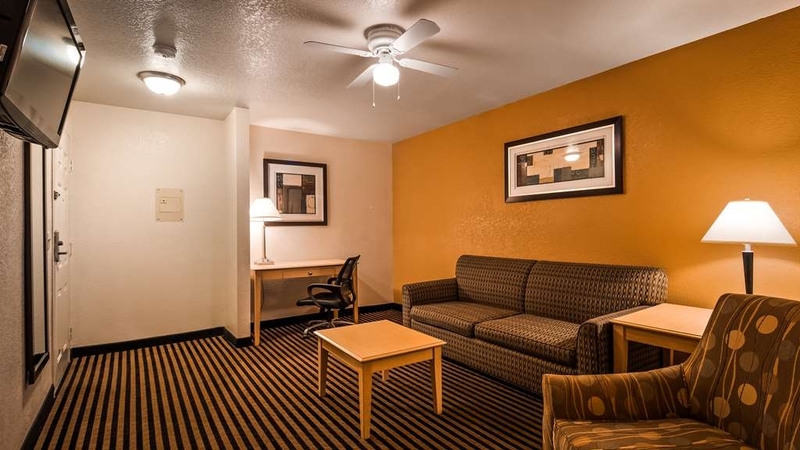 Thank you, Sigmund R, for your review of the Best Western Plus Executive Inn & Suites. I apologize that this stay was not enjoyable for you and you experienced so many issues. I apologize that our front desk seemed to show a lack of interest and responsibility for the problems you experienced. I will share this with our front desk staff and use your review as training so we can focus on improving for all of our future guests. I hope you will consider giving us another opportunity to serve you in the future. Are we good for the survey ? What is this section for? I stay here every once and a while. Stay is pretty good. I do not like make the U - turn all the time to get to the hotel. But apart from that it's ok. Thank you, alejandrogN7246DW, for your review of the Best Western Plus Executive Inn & Suites. I am glad you had a good stay with us and that you have chosen our location on multiple times. I apologize that the U-Turn can be inconvenient. I look forward to hosting your next stay! Thank you, Josh N, for your review of the Best Western Plus Executive Inn & Suites. I apologize that our pool can get full of kids. We do not rent out our pool area for parties. We get a lot of children sport teams that stay with us frequently and they do fill up our pool area but they are paying guests. I am very sorry that you were not able to enjoy our pool because of this. I hope you will reconsider giving us another opportunity to serve you in the future. "Easy access for travel and business, not great for leisure." 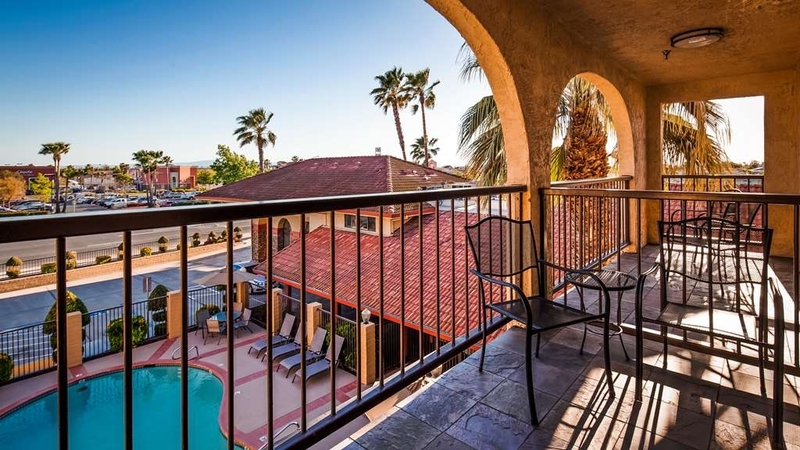 Conveniently located off the freeway and in great access to restaurants and shopping. The staff was nice and the room was clean but the room I was in had the most horrible smell. I addressed the problem with the front desk but I had the last room to be reserved so there was nothing else to switch into. It was also a Saturday Night so all other hotels in the area were also full. The front desk gave me a bottle of industrial grade Febreze but it was no match for whatever was creating that awful stench; It was like a mixture of smoke and mildew. I had arrived after 11pm so I was ready to go to sleep but the smell irritated me and caused some discomfort. In the morning I had to wash all the clothes I had brought with me because the smell of the room was clinging to my belongings. This hotel looks great and it is located in a great spot to stop on your way towards your destination but it fell way short of the standard I have come to expect from Best Western. Thank you, X26620Aalejandroa, for your review of the Best Western Plus Executive Inn & Suites. I apologize for what you experienced during your stay with us. I will share this review with our housekeeping team so we can do our best to ensure that future guests do not experience the same problem. I hope you will consider giving us another opportunity to serve you in the future if you return to our area. 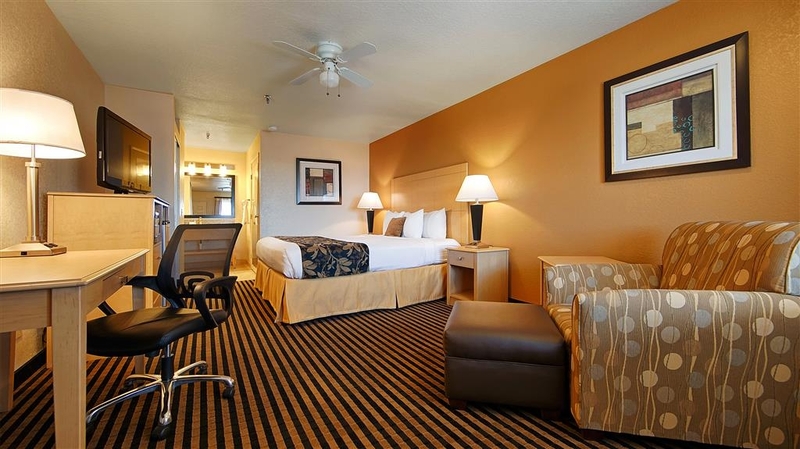 "My stay AT BW Manteca"
The room was nice and comfortable. The breakfast area is really really small and crowded. I felt like a sardine waiting to eat. Also the walls are very thin so you can hear all of the traffic and anyone talking outside. Good location, there are lots of restaurants, shops and gas close by so it made convenient to stay there. Never, ever again. The room smelled terrible, like perfumed cigarette smoke. There was hair on several towels, in the sink, and the bathtub (not to mention sticking out of the hairdryer). The bed was uncomfortable. The "clean remote" had some sort of dried fluid on it. I will never, ever return. I feel gross just thinking about it. This was a beautiful place. Ask for the rooms that look over the pool. The inside rooms are quiet. The bed was very comfortable. The breakfast is great, eggs, sausage (with lots of flavor) waffle maker and great choices of fruit and yogurt. It's close to the freeway, In and Out burger is accross the street and many other eating places and shops. It is two adjourning rooms that make it perfect for a family!!! I wish more hotels offered this package, very good deal. The staff were really friendly and tried to accommodate our group needs. They even let us use a conference room for our soccer group's night get together! Great experience. The pillows could be more comfortable but for the value it cannot be beat! "Business Trip - Great Hotel Experience"
Wonderful room - they upgraded us to a suite - great price - loved the room - very quiet - lot of parking - they had a security guard and we would definitely stay there again - and probably will in future. Thank you, clarac704, for your review of the Best Western Plus Executive Inn & Suites. I was pleased to read your wonderful comments. I am glad we were able to provide you with a great stay. I look forward to hosting your next stay. "Not Too Much For A Lot!" To me almost 200 bucks should get you a very nice room. I could not sleep a wink in this place because it felt like a race track was on my ear all night. I realized that the room was right by a freeway onramp and cars, diesel trucks, and loud muffler roadsters were speeding up to get on. We also got a third story room and used the stairs to get up with all our bags and stuff because the elevator was pretty far. Should of been a discount for that room. 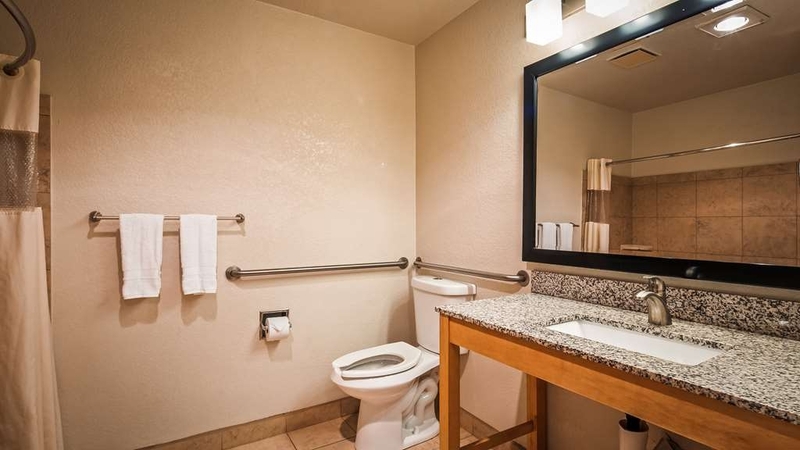 In Manteca of all places, where the freeway is your view, this room was way overpriced. The staff were the best part. They were very friendly and helpful. They helped me find the breakfast which was ok.if you like powdered eggs and sausage. Overall I would not return to that place even if I have to travel farther to get a better one for cheaper. Thank you, Martha M, for your review of the Best Western Plus Executive Inn & Suites. Our market does have very high rates during certain busy times. I apologize that the noise made your stay unenjoyable. We also offer suites in an interior corridor that is much quieter as well as try to accommodate requests to be away from the highway for our light sleepers. I am glad that our team provided you with good service. I hope you will reconsider staying with us again in the future and give us another opportunity to serve you. We were traveling to spend weekend with family. First time traveling with our dog. For a hotel that accepts pets, thought it was clean. While the rooms were maybe a little dated, they were fine for the price. We had an interior courtyard room and I actually thought the noise from other guests would be worse - not bad at all. Breakfast was fine, although the breakfast room is quite small and was very warm - we just brought food back to our room. Trays to facilitate doing that would have been nice. Didn't spend that much time in the room. Staff was friendly. Not really anywhere to walk dogs either. I'm sure if I had asked, the staff would have directed me somewhere. Hotel surrounded by rather busy streets. 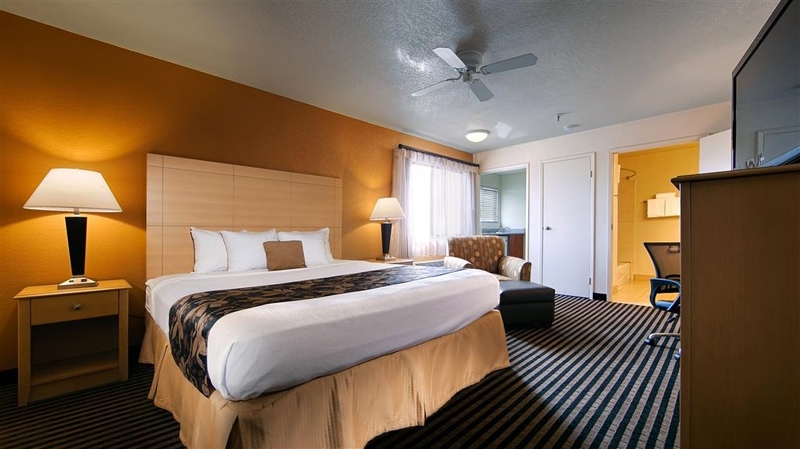 Thank you, karenweaver25, for your review of the Best Western Plus Executive Inn & Suites. I am glad that our hotel met all of your needs and that we were able to accommodate your furry family member as well. We will be adding a larger breakfast facility in the near future. I hope you will stay with us again if you return to the area. The sheets in one of our rooms were dirty. When we called the front lobby, it took them over 25 minutes to show up and check. They brought back one sheet (not the entire set), gave it to us, and told us to change the sheets ourselves. Thank you, Rodolfo D, for your review of the Best Western Plus Executive Inn & Suites. I am very sorry for what you experienced while staying with us. Checking you into a room that has not been properly clean is completely unacceptable on our part. Even worse our staff failed to make the problem better for you. I can assure you this is not the norm for us and we strive to make every guests stay enjoyable. I hope you will consider giving us another opportunity to serve you in the future so we can provide you with a better experience. "OK for one night stop-over"
Stayed here in October after 11 hour flight into Oakland. Room was comfortable and clean. Hated the four mini pillows though. We were given a side room facing the highway, this was noisy and didn't seem to quieten down during the night. Room seemed dated, but was ok for one night. Breakfast was fairly standard free offering, nothing special.Served it's purpose for a one night stop, but wouldn't want to stay any longer. 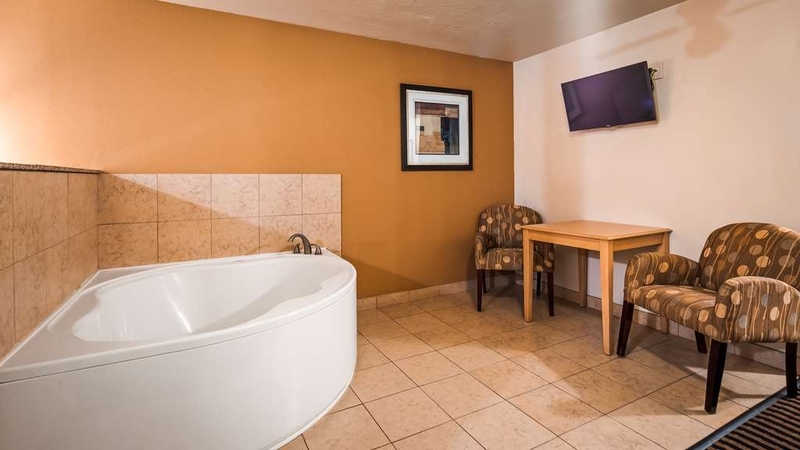 Thank you, Hayzeebloke, for your review of the Best Western Plus Executive Inn & Suites. I am glad that our hotel met your needs for a night. I am sorry that we failed to do more to impress you. We do have suites available in an interior corridor which is away from the highway and have more amenities then the standard room you stayed in. I hope you will consider staying with us again in the future to see what other rooms we have to offer. I loved this hotel. We were a group of four girls on our way to Yosemite. We all arrived in San Fran. The hotel was about half way to Yosemite. It was roomy and clean! One room had a small kitchenette & the other room had a microwave. There was a great free breakfast included. Plenty of parking. The staff was very friendly. 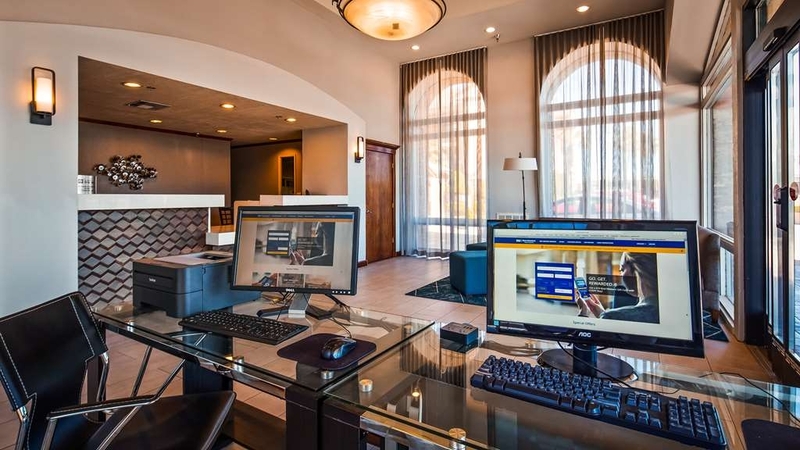 Thank you, tmflyaway, for your review of the Best Western Plus Executive Inn & Suites. I am glad that our hotel met all of your needs while traveling from San Francisco to Yosemite. I hope that you will choose us again if you are ever passing through in the future. This hotel is kind of a dump but I had no alternative. The hotel is noisy, the hotel is very tired, the staff is trying but untrained and the "full breakfast" would be something for inmates. If I had a choice I'd stay elsewhere. Thank you, Barbara S, for your review of the Best Western Plus Executive Inn & Suites. I apologize that your stay was not enjoyable. We will use this information to focus on improving for our future guests. If you are a light sleeper, it may be best for a room away from the street/highway, there is a bit of traffic noise in the front at times, this is a busy area. Breakfast was good, a decent variety to choose. Rooms are nice, nothing fancy but a good value. A lot of food places to choose from within walking distance. Access to the hotel is not terrible once you get used to driving down the street a few blocks and making a U-turn. Thank you, DAN R, for your review of the Best Western Plus Executive Inn & Suites. I am glad that our hotel was able to meet all of your needs. We do offer suites that are away from the road in an interior corridor for light sleepers. I hope you will choose us again if you ever return to the area. Thank you, Annamarie T, for your review of the Best Western Plus Executive Inn & Suites. I was pleased to read that we were able to meet all of your needs on your second stay. I look forward to hosting your next stay! We stayed here about 2 months ago and we were very impressed with the continental breakfast,we expected pastries,waffles,cereal & oatmeal. But to our surprise they had that plus biscuits, gravy,scrambled eggs, & sausage. So we booked a room again,the room was $145. per night & there was no biscuit & gravy. We were highly disappointed. Thank you, Pamela S, for your review of the Best Western Plus Executive Inn & Suites. I apologize that you were disappointed with this stay. We typically do the biscuits and gravy during the week to provide variety for our corporate guests that stay with us during the entire week. We will look into adding it on the weekends in the future as well. This was the most ghetto hotel I've stayed in. The hotel actually allowed a party with a DJ blast music all night. Our walls were shaking. It was like trying to sleep next to a night club. We have small children and could not get them to sleep. We were scheduled to play a baseball game at 8 am and had to be at the stadium at 7 am. Had the worst night. The parking lot had small drinking groups that looked like thugs with their pants hanging past their underwear and seemingly only able to communicate with each other through loud cursing. Unbelievable that it stays in business. Other guests were walking the halls shaking their heads incredulously that a hotel was run in such a manner. If you're going to host a party, rent the whole hotel out to that party or tell guests before they book their rooms that there will be a loud party outside your room that night. Furthermore, it's the only hotel I've stayed in that actually ran out of shower towels. They literally did not have enough shower towels for their guests. I'm involved with multiple sports teams and this hotel will never be recommended by me. It's unbelievable how certain people in our society can have such a lack of respect for others around them. It's even more incredible that a business actually caters to such people. 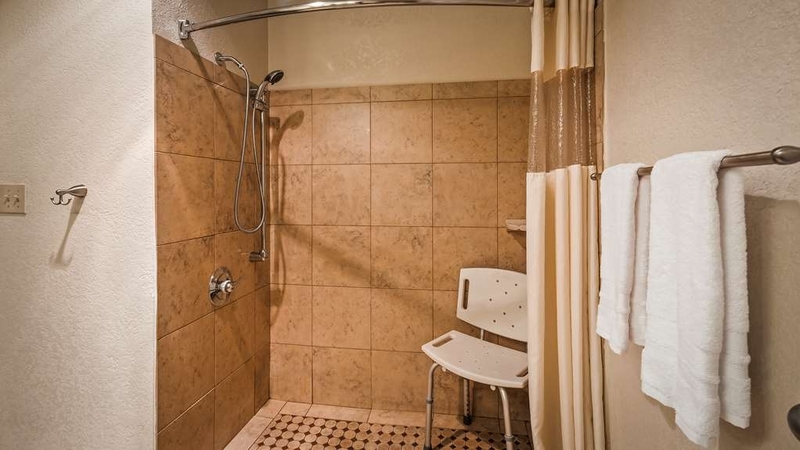 I'd expect this from a cheap motel, but I had a little higher expectations paying $200 a night. 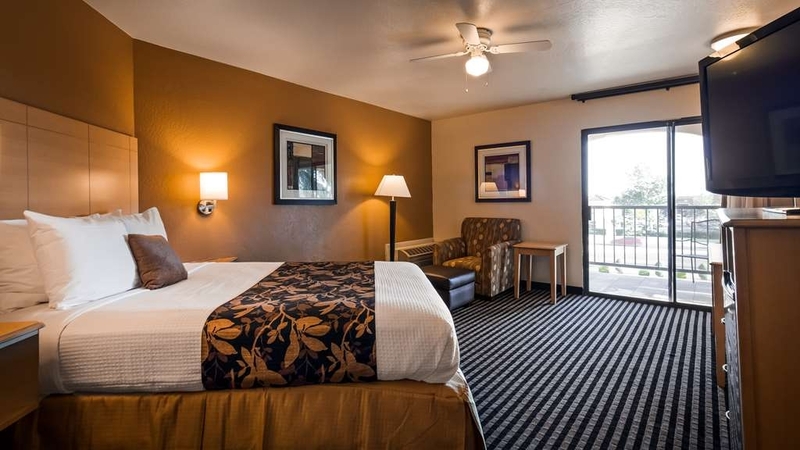 Thank you, seizen007, for your review of the Best Western Plus Executive Inn & Suites. I apologize that your stay was not enjoyable. We did not allow a party with a Dj all night, our banquet room was rented for an event that ended at 10:00 p.m. The people drinking in the parking lot were parents from one of the teams staying with us. We did our best to keep them quiet but unfortunately our options were limited as we could not make them leave the hotel as they had children and should not be driving. I can assure you that we do not allow people like this to continue to stay with us. Again, I am very sorry that we did not fulfill your needs in a hotel. We will use your review to focus on improving for all future guests. My wife and I stayed 5 nights because we struggled to find anywhere nice to stay in Manteca. While the room itself was quite nice, having been recently refurbished, the air conditioning unit was very noisy and the room was very clean, as was the swimming pool. What we struggled with most was the dining room was way too small to accommodate the number of guests and the breakfast was way below average. We wanted to do some laundry but the washing machine and drier were covered with people's filthy dirty smelly clothes lying all over them. We asked at reception about where else we might be able to do our laundry but they were no help. We most certainly were NOT going to remove the filthy washing, nor put our clothes anywhere near the machines!! One night a group of people were playing Mexican music excessively loud in the lift, then outside rooms. It was quite late at night and when I asked them politely to turn the music down they pretended to not understand me and ignored me. We phoned reception who eventually sent someone and much later the music stopped. Would we ever stay again, or recommend this place to others.... a definite NO!!!!! Excellent facility, Awful location. Super noisy, due to Freeway Overpass and extremely busy Intersection. Noise, late into the night. Need to sound proof rooms due to noise. Bed was fine, room was clean, nice Breakfast. Really nice facility, just way too noisy. "Room better than the exterior"
This motel has below average exterior and common areas, kind of dumpy. Our room interior, however, had been recently renovated, pretty nice, and was above average of similar type places. The location was convenient to the highway, but very noisy location directly next to the highway and not a great neighborhood. This hotel was located centrally to where we needed to be. Room was clean and staff was pleasant. Just stay away from the sofa sleeper. The "free breakfast" was just ok, coffee was very good! Staff working the breakfast area were very friendly and helpful. Eating area is very tight. This is a great hotel, the front desk was very helpful, the room was very clean and comfortable. There is a nice pool and hot tub. It is far enough from train, i was able to have a restful sleep. Close to restaurants and highway. The place was clean enough but the clientele was awful. A man screaming profanities at his girlfriend in the parking lot; people smoking in the pool area. Can the management get control over this? I hope so! Be prepared for a lot of beer drink from shirtless guests yelling at others in the pool with children. We did not feel safe and i had my phone in hand to call 9-1-1. And i should have also had protection with me while at the pool and walkiing around teh hotel. This hotel needs security for quest protection and be selective of quest they serve. Maybe a no beer policy. Maybe shirts are required? The hotel looks great BUT not a safe feeling. Pros: Rooms were quiet and clean Cons: Traveled for work and was told they needed a check 1 month in advance and then told 1 week in advance. Other hotels and other BW I've carried the check with me and given on day of check-in. Locked out of my room 3 times during my stay and was told I was the one doing it. I've never been locked out of a room before. The room was huge and connected to the other room. We used both rooms. Having a place to make coffee, use the microwave and the refrigerator makes the stay more comfortable. I do have to say that the pillows were not that comfortable but all in all we had a pleasant stay. Breakfast was nice as well and the late check out helped us as well. "The Best Hotel on our Trip"
This was the best hotel we stayed in during our 10 day trip. The staff was super helpful and very nice. The rooms were clean and comfortable and breakfast was great! We have six kids and the room comfortably fit us all. "Busy hotel during the summer with sports kids." A pleasant stay on our drive down the west coast. The hotel was busy with lots of kids going to summer soccer tournaments with their folks. The breakfast room was a bit small to cope with all these people, and the waffle iron was broken so we missed that part of the breakfast. This hotel is great , the rooms are nice and comfortable , Shelly at the front desk and the guys all try and make you feel great while staying with them . One night i bought food and forgot utensils and I called the office and sure enough Shelly had them for me before I came down to the office . Shelly always had a smile on her face. Thank you, Desiree V, for your awesome review of the BEST WESTERN PLUS Executive Inn & Suites. I am happy that Shellie and the rest of the staff provided you with great service. We appreciate you taking the time to share your positive comments. I'm giving this place four stars based on several Best Westerns we have stayed at in recent months. But we didn't actually stay there. We booked "Last Room Available" on TripAdviser, but when we got there the desk lady said TripAdviser had overbooked and there was no room. We ended up driving about 15 miles on to Oakdale and finding a Motel 6, which was clean, comfy and quiet, but no breakfast included. Thank you, George M, for your review of the BEST WESTERN PLUS Executive Inn & Suites. I am very sorry for the overbooking and I regret the fact that we were unable to accommodate you. I hope if you every come to the area again you will give us another opportunity to serve you. Anthony was very helpful and polite while checking in. Great nights sleep and everyone.was friendly. Also, breakfast was yummy. Our room was clean and very attractive upon arrival. We only stayed one night because we headed to Yosemite the next day but we would definitely stay here again. We also ate dinner at Black Bear Diner and it was great! Thank you, loris92016, for your review of the BEST WESTERN PLUS Executive Inn & Suites. I was pleased to read that you had a great stay. Thank you for taking the time to share your positive comments about our hotel. "Not bad, but not great either"
This is an older hotel which has been freshener with a paint job and some new fixtures. On the plus side the room and the linens were clean and smelled fresh. On the negative side the paint job could not hide the rust on the door hinges or the dents in the bathroom door frame. Just like another reviewer we had trouble with the electronic door locks. The staff was accomodating and apologetic. Based on reviews we were expecting a better breakfast. It was just okay. All in all I would stay here again if I couldn't find something better. Thank you, Ken L, for your review of the BEST WESTERN PLUS Executive Inn & Suites. We strive to ensure every guest has a great stay with us. I apologize that your experience was just okay. I hope you will give us another opportunity to serve you in the future and hopefully we can make your next stay great. Pleasant enough stay. Clean rooms, nice breakfast, friendly staff. There's a Mexican restaurant right next to it (within walking distance) that's to die for. The front desk clerk recommended it. They kept the pool open for my friend and I after we had a long day of driving. 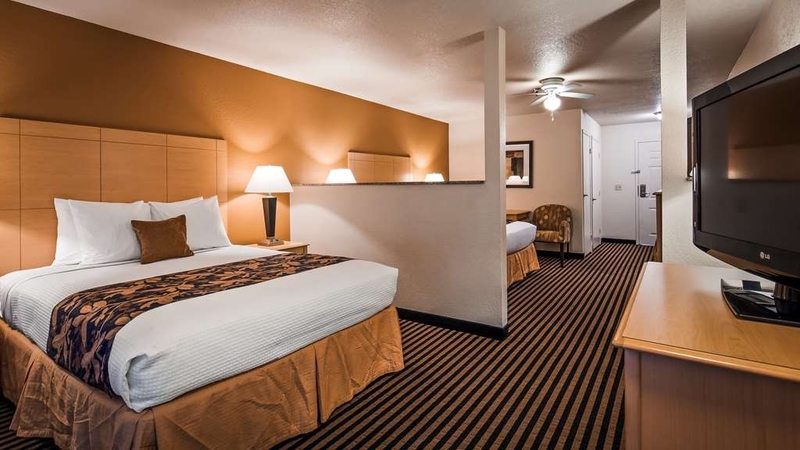 Thank you, Dea W, for your review of the BEST WESTERN PLUS Executive Inn & Suites. I am glad our hotel and friendly staff made your stay enjoyable. The Taqueria La Estrella is a favorite for most of our staff members, we are glad you enjoyed our recommendation. We hope you will stay with us again if you return to our area. Needed a good nightsw rest after 5 hour drive and all night family reunion. Best Western on Manteca came through. Excellent location, excellent facility and most excellent staff! Because of Best Western Excellence in Service we only ever stay at Best Western as we travel through all 50 states of USA. Beautiful place to visit, wish I hadn't stayed there this time. Have stayed at best westerns over the years and always been satisfied. 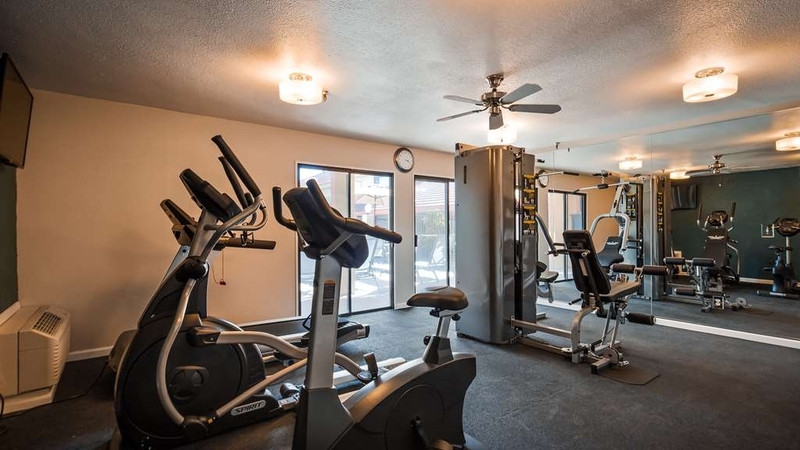 This property was very well maintained, easy access, and large, comfortable accessible suite. Unfortunately, no hot water for duration of stay and no internet. Desk staff very professional, but seems like someone could have been called in to get hot water heater going. They were notified about 4:30 and I was told maintenance was gone for the day. Could not change rooms since hotel was booked...so it must be a popular place. Just a really difficult stay for my purposes. "Be very aware... be warned"
Decent property. Clean, well maintained. Stayed for 2 nights. On a trip with our pick-up with camper. During our stay, someone stole the catalytic converter from my truck. Replacement cost $3300 USD!! Contacted manager - could not be less interested to here what happened. Contacted police and was told "I know the manager there, we have dealt with them before". Should have clued in when we saw how many closed circuit cameras there were. Also, security guard "on duty" all night. Yet, nothing was detected. Lesson learn here - very expensive lesson. Ask about crime on property before agreeing to stay. Very nice property that is very convenient to the highway and lots of local restaurants. This hotel was very quiet in spite of our room bring right off Highway 99. I never heard the traffic! Very easy check in and out. Highly recommend this hotel. Nice and comfortable room. Excellent stay.. Room was great and very roomy. Clerks were very nice. Pool was cold and the hot tub had bugs. We still got in but wish they had a net to get them all out.. Breakfasts was good. plenty to choose from. The inside of the hotel and the rooms are nice; however, the area surrounding the hotel is "OK", can be a little rough a couple of blocks away. The hotel was pretty quiet, the room was pleasant, staff is nice, but the pillows are lumpy so you may want to bring one from home. "I will never stay at this hotel!!" Hotels is nonsmoking hotel, but as soon as I got to my room it smells so bad! I called the front desk if I can get another room because my son have asthma, he said there was no more available rooms. So I asked if I can get my refund since they can't accommodate me and he said no refund on cash. I didn't stay there and didn't even get my money back. We do a lot of traveling for soccer with my boys and I will never ever stay at that hotel again!! Target destination for us was Stockton but they were full and the trip was spur of the moment. They were full and the closest Bw with available rooms was this one. I was pleasantly surprised by the property and breakfast. I will be back. Nice stay! We have stayed in many Best Western Hotels over the years. It is worth it to be a member for the added service. Best Western Manteca had the best breakfast we have ever had at any of the Best Western Hotels. Most all hotels of the same quality for that matter. AWSOME service! Very friendly staff! Very clean everywhere great breakfast! Would come back to this hotel anytime! Really recommend this hotel to anyone especially state/government employees, they have great discounts for us! Very happy with everything here!?????? The hotel is close to the freeway, so along with the noise, there were many large trucks, vans taking up multiple parking places. Limited parking. The room was only supplied with 2 towels, one hand towel, and one washcloth. Thankfully it was just myself so the one was fine. The housekeeping did not replenish the coffee cups and water glasses I had used from the day before. Had to go to front office for these. I stayed 2 nights, but the office staff only set my key cards for one night. So when I returned to my room the next day I had to carry all the bags I had carried up to my room on the third level at the far end of the hotel down to the office to have my key cards reset. My boyfriend and I stayed at this hotel for two nights and enjoyed our time here. There's no need to worry about the hotel being located right next to the freeway, we heard no noise whatsoever. The decor and overall look of the hotel is nice. The staff was friendly and the room was a decent size. The only complaint I would have is that our room was directly next to the elevator. So we constantly heard crowds of people getting on and off the elevator all day/night. Bummer. Other than that, I would definitely stay here again and recommend my friends / family to stay here as well. I would recommend this place to anyone staying in Manteca, California. It was nice that we were able to have our dog stay with us at no extra charge. Everyone that we encountered was very helpful and friendly. We would definitely stay again. "Nice place but has roaches"
The stay was uneventful. Busy street area, but quiet. Nearby lots of restaurants, gas station and stores. The first room smelled terrible like cigarette smoke, but they moved us without hesitation. The breakfast was hot and basic. Our family enjoyed the waffles and yogurt the most. It is clean and quiet. The pool stayed pretty busy, but it was nice and quiet, We will definitely stay there again. "Good Stop for a night." Good hotel for just passing through. Room is comfortable and clean. Hotel offers free breakfast. There's lots of food and shops very close by and it's right next to Hwy 99 which made it easily accessible. Having grown up in Manteca and coming home to visit my mom it was a little weird staying in a hotel I have driven by many times. Overall it was a good experience. Housekeeping continuely shorting us towels and wash cloths, and the limited selection of television channels were the only concerns. We stayed at the Best Western Plus in Manteca and couldn't of been more happy. The rooms were a great size and very comfortable. The jacuzzi looked tempting even though it was raining my kids enjoyed it. I appreciated the receptionist offering to have both of our rooms next to each other. Great service! everything at this place made me feel safe. and this is a good thing to me. many times I am in a different place where I do not know anyone for business the next day, and I usually get to my destination late at night. the first thing I encountered was a polite security guard and was greeted nicely from the clerk. I got to my room and realized I forgot something in my car and I seen that the security guards actually patrolling the grounds. the only issue I had was the comfort of the bedding. this bed itself was comfortable, however the mattress pad was so uncomfortable and itchy wool that I slept on top of everything and used my own personal blanket and turned up the heater. Superb stay !!! Recommend to others. Very clean rooms , feels like an upscale hotel!!! Pleasant staff, convenient location, affordable price, great sleep quality. Nearby restaurants, banks, a hospital. If you are traveling and are close to Manteca Ca it is well worth the time and effort to stay at this establishment. They are very customer orientated and have a very clean and well maintained facility. "no rest and no peace"
"BW is a Clean Value"
You can only enter and depart property from one direction which can make things a bit cumbersome but the value makes up for it. Rooms are very nice. Room was clean and everything worked as it should. Didn't have a chance to try breakfast even though they open at 6am. This hotel was awesome and although we had a problem with the toilet when we checked in our room, it was quickly remedied by the hotel manager as she moved us to another room. Our stay was excellent, the breakfast was good, and Shellie was awesome in helping us to decipher what restaurants to eat from. We would definitely come back to this Best Western Hotel!! The employee's make this a great place to stop. We felt welcomed as soon as we entered the hotel. Fresh baked chocolate cookies at night? Are you kidding me! "D" (manager?) was the best. We will definitely stay here again when coming through Redding. A great place to stay for visiting in the area or just overnight. They offer a very good breakfast, more items than most with eggs and sausage. We had a nice clean and comfortable king bed room. It is good value for the money. "I forgot how much we enjoyed Best Western Properties"
It has been a few years since my wife and I were in a location where we could book at a Best Western, but this past weekend we had a business banquet just ten miles south of Manteca and decided to stay at the BW Plus Executive Inn & Suites and are delighted that we did. We arrived late afternoon, in time to check in, change our clothes and get to the banquet. We got back to the hotel around midnight and were back on the road early the next morning, but it was a delightful experience. We were greeted on our arrival with a very efficient, friendly receptionist, given directions to our room as well as directions to our destination. Our room, on the ground floor facing the 99 freeway, was large and clean with all the amenities we could ask for, even though our stay was too short to use them. We didn't have any use for the coffee or coffee maker, the reefer or the microwave, but it was nice to know they were available. The TV had more channels that we could ever use, including our favorite news channel, FOX News. We did not notice any loud noises from the highway and my wife is a very light sleeper. The heater/air conditioner was very efficient and had our room to a comfortable temperature within minutes. The mattress was firm providing a good nights sleep and there were numerous outlets around the room to plug in our cellphone chargers with enough left over for computers should we have had them with us. We checked out early the next morning, not having time to avail ourselves of the complimentary breakfast, but the two ladies who checked us out were just as friendly and efficient as the one who checked us in the night before. The property is located just off the South 99 Yosemite exit and the road bends around the property. The narrow driveway comes up sooner than we expected and if we had missed it we would have had to negotiate a few "U" turns to get back to it. BUT, as a clue, it is located about 1 foot west of the fire hydrant, so look for the hydrant and turn in - no problem. If we ever have business in that area again we'll be sure to stay there. Thank you BW for a delightful experience. "Great bang for your buck..."
The property was clean, it is literally right off the exit ramp. It is very difficult to get into the property you get one driveway and if you miss it, you need to go around the loop to get back in. The rooms and the entire place are dated, 1970's would be my guess. Everything is well maintained, but the neighborhood around it is run down. They have a security guard that makes rounds of the parking lot, pool and hallways. WiFi is medium speed, and free breakfast has eggs, waffles, cereal, etc. Not a vacation destination, but a reasonable place to stay while in transit or visiting relatives. "A dated property that does not deserve the "Plus" label." The room was spacious and beds as expected. Unfortunately, the bathroom sink was not closed off, which causes early risers to wake others in the room. The door did not close shut automatically, but there was no significant noise (a complaint by prior guests). The breakfast room was so small, so crowded, and so lacking in any appetizing food that we skipped the breakfast and ate elsewhere. We were surprised at the high price for this room, and were told that week-end sports drive the prices up. We had the opportunity to stay the weekend here while working in the area. We were satisfied with the prices, the room was nice. 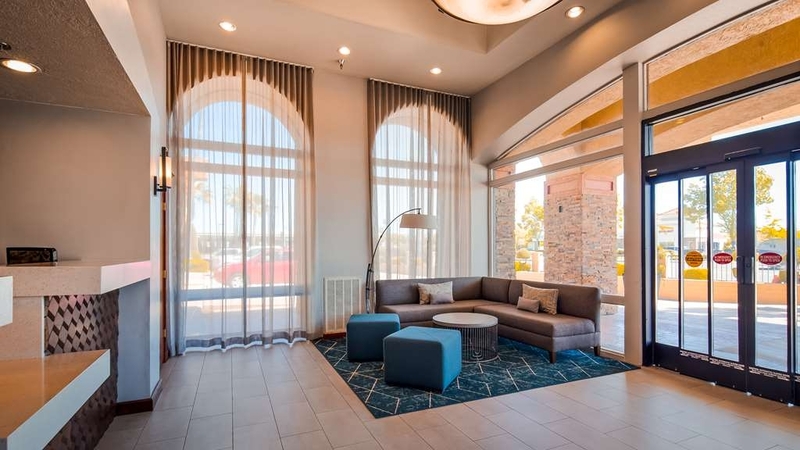 The best part was the location - very easy commute to our location, this hotel is right next to the freeway, and very close to stores and restaurants in the area. "Nice But Roach Infested. " Stayed last weekend at this facility. Nice, decent rooms But immediately noticed cockroaches in the room. On the bed, desk and wall. Our kids room also had the same infestation. Brought it to the attention of management with no response. Obtained and applied my own spray. Will never stay there again. "Good deal overall but problem with wi-fi"
This hotel is in a convenient location just off Highway 99. The rooms are well done and clean, and the breakfast is pretty good for a relatively small hotel. I would have given it a rating of 4 but the wi-fi password we were given didn't work, and even though we notified the front desk the problem wasn't fixed. "If you're on business, try to avoid this place"
This was the best hotel I could get into within the government per diem in Stockton. I would consider this hotel - really a motel as barely acceptable. If you're on business, there is no work space in the room ho easily accessible power outlets, internet is pretty slow, etc. Would not be my first choice next time I'm in Stockton. It's not dirty per se, but well used. Great experience after a lim day of driving. The young lady at the front desk was very helpful and got me into a very nice room in good time. The price was far better than I expected for a the room I got with a king size bed, large flat screen (LG) with ton of outlets. Breakfast had a large selection. 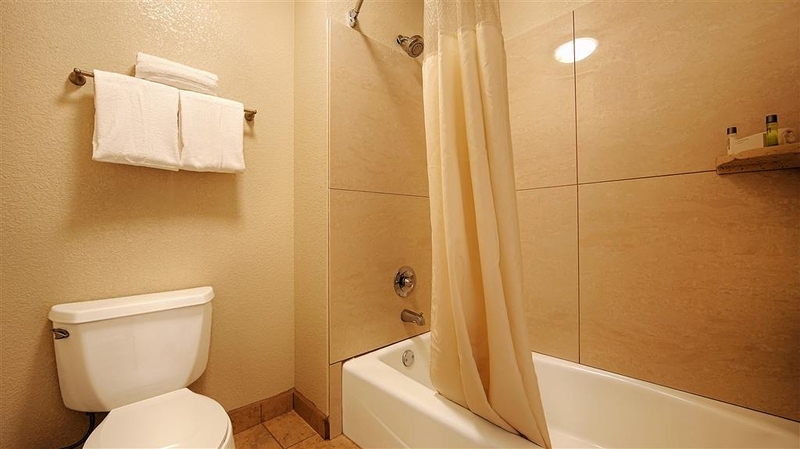 Convenient to I-5 and 99, with easy freeway access. Nearby restaurants provide a variety of menus at reasonable prices. For away work in this portion of the Central Valley, this location is ideal without having to drive too far to reach you destination. BEST WESTERN'S Manteca, CA site has helped me to reconsider BW for future lodging. 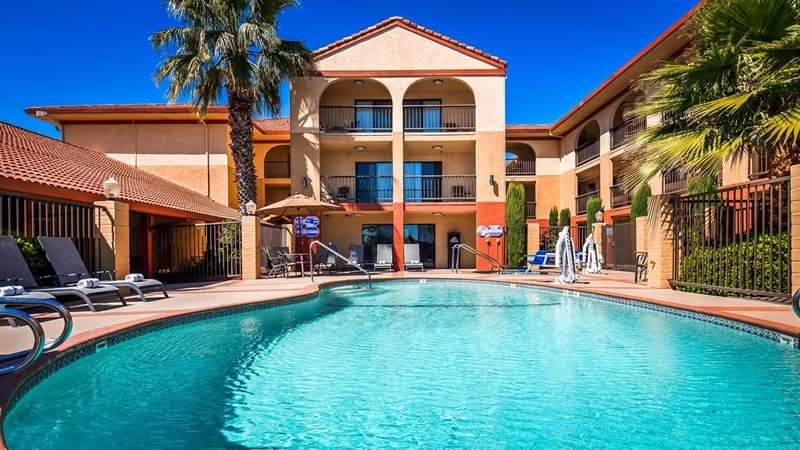 Some of the BW'S at which I've stayed in So Cal do not even compare to Manteca's BW...if rooms are available for my next Tracy/Manteca trip, I will look to reserve my room at BW'S Manteca site. The room was great, the breakfast was OK. Did not care much fro the Chinese Buffet next door, yech. Difficult to enter the hotel, one way in, miss the entrance and you do a few u-turns. The internet sucked. Slow and often getting kicked off. If you don't need the internet like I do for my job, a great place to stay. Our group stayed here for a baseball tournament. We were very pleased with our stay - the rooms are basic but nice and quiet. Breakfast was quite good. Pool was great in the 100 degree weather. Con: Finding the front entrance is a bit tricky at first.